BALTIMORE, April 17, 2019 /PRNewswire/ -- Wilmington Trust and its parent company M&T Bank announce today a partnership with the world-renowned modern dance company, Alvin Ailey American Dance Theater, to launch a four-day, in-school residency in two local Baltimore schools from April 23-26 for students of Henderson-Hopkins and Baltimore Leadership School for Young Women. Alvin Ailey American Dance Theater in Alvin Ailey's "Revelations." Photo by Paul Kolnik. Nasha Thomas leads students in an Ailey “Revelations” Residency at Washington Carver Middle School, the school Alvin Ailey attended. Photo by Drew A. Kelley. Through this partnership, Ailey will conduct a workshop, "Revelations: An Interdisciplinary Approach," where students will be introduced to the life and accomplishments of Alvin Ailey while using dance as a vehicle for developing self-esteem, self-discipline, creative expression, and critical-thinking skills. The program will be led by Nasha Thomas, a former member of the Ailey company, who is now national director of AileyCamp and a master teacher who implements Ailey's Arts in Education & Community Program residencies across the U.S. The young students will be introduced to the innovative curriculum-based residency program, which is inspired by Alvin Ailey's signature work, "Revelations," along with a special "Show and Tell" demonstration, featuring stars from the worlds of dance and football. They will also have the opportunity to see Ailey's first-ever two-act ballet, 2018's hip-hop "Lazarus" and "Revelations" at Baltimore's Modell Performing Arts Center at the Lyric during the world-renowned dance company's engagement on April 23 and 24. "At Wilmington Trust and M&T Bank, we foster a culture of community involvement. We have a genuine desire and actively work to make a difference in our communities," said Doris Meister, executive vice president of Wealth Management at Wilmington Trust. "I have seen the impact the arts can have on young people and their families. By making the arts available to all, communities become healthier and stronger. That is why Alvin Ailey had two missions when he started his dance company in the late 1950s. He wanted to build a world-class dance company and to pursue a social mission through his commitment to educational programs in dance." Students will also have the special opportunity to hear from dancers and well-known Baltimore athletes who will share their empowering success stories and perform an exciting demonstration exemplifying their artistic and athletic abilities. "Alvin Ailey was a pioneer in celebrating the human spirit through the African-American culture and modern dance, and we honor his legacy by elevating the artistry of our performances and extending the reach of our educational programs to people of all ages and backgrounds," said Robert Battle, artistic director of Alvin Ailey American Dance Theater. "This invaluable sponsorship strengthens the Ailey organization's service to the local community and next generation, giving area youth the opportunity to experience this unique residency and a performance featuring 'Revelations,' the must-see masterpiece that opens hearts and minds, just as it did mine when I was a student." "M&T Bank is a proud and active community partner in Baltimore, and we support many local education and arts organizations with charitable dollars, volunteer hours and board service," said Augie Chiasera, Baltimore regional president for M&T Bank. "We're excited to bring this experience to the students at Henderson Hopkins and the Baltimore Leadership School for Young Women." Wilmington Trust and M&T Bank have a heritage of improving the quality of life in the communities where they do business. Supporting the local nonprofit and charitable organizations has been a tradition for more than a century and arts and cultural partnerships have been at the cornerstone of many local programs. Most recently, M&T Bank was named the Founding Bank of The Shed, New York's newest cultural art center, and both M&T and Wilmington Trust will sponsor its performance series. Alvin Ailey American Dance Theater, recognized by U.S. Congressional resolution as a vital American "Cultural Ambassador to the World," grew from a now‐fabled March 1958 performance in New York that changed forever the perception of American dance. Founded by Alvin Ailey, posthumous recipient of the Presidential Medal of Freedom–the nation's highest civilian honor, and guided by Judith Jamison beginning in 1989, the Company is now led by Robert Battle, whom Judith Jamison chose to succeed her on July 1, 2011. Alvin Ailey American Dance Theater has performed for an estimated 25 million people in 71 countries on six continents—as well as millions more through television broadcasts, film screenings, and online platforms—promoting the uniqueness of the African‐American cultural experience and the preservation and enrichment of the American modern dance tradition. 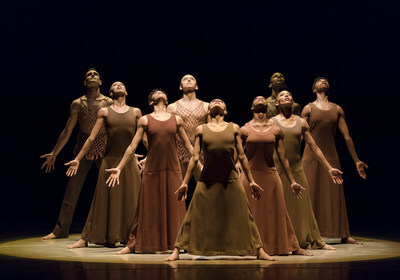 The Ailey organization also includes Ailey II (1974), a second performing company of emerging young dancers and innovative choreographers; The Ailey School (1969), one of the most extensive dance training programs in the world; and The Ailey Extension (2005), a program of dance and fitness classes for the general public. Each year, Ailey's Arts in Education & Community Programs educate and inspire over 100,000 young people in classrooms and communities through student performances, lecture-demonstrations, technique classes, curriculum-based residences inspired by Alvin Ailey's signature masterpiece Revelations and AileyCamp, a unique summer day camp in cities nationwide. For more information, visit www.alvinailey.org. The Patricia and Arthur Modell Performing Arts Center at the LYRIC is one of Baltimore's oldest and most venerable institutions. The Lyric Opera House was opened on Oct. 31, 1894 to immediate success. The historic theatre boasts a Baroque shaped rectangular hall with side balconies and a wide oval-topped proscenium characterizes the architecture of the building. The acoustics of The Lyric are renowned. Conductors that have performed here, including Pierre Monteux, Charles Munch, and Leopold Stokowski, ranked the Lyric among the three best auditoria in the country. Conductors and performers share an enthusiasm for the "glorious Lyric sound." It is because of the unique acoustical qualities of its interior that many support this cultural and architectural landmark. Today the Modell Lyric is renowned for the diversity of its programming. Musicians, comedians, and dancers still love appearing in this historic venue. Performances now appeal to people of all ages and reflect the varied interests of people in our region. The Education Department works outside of our building with students to help them find their own voice through several excellent programs which have a positive impact in our community. For additional photos and press materials please visit pressroom.alvinailey.org. For more information on Alvin Ailey American Dance Theater's Baltimore engagement, click here. For more information on Alvin Ailey American Dance Theater's 60th Anniversary North American tour, click here.